Years ago, a good friend of mine brought our family a big bag of Chex Mix for Christmas. Expecting the same old salty (dare I say boring?) Chex Mix that I was used to, I was caught off guard when I took the first bite of our Christmas treat. It was so good! Even the coconut-haters in the family overlooked the fact that there was coconut in it and gobbled it up, too. Since my friend has since moved away and no longer brings me big batches of Ooey, Gooey Chex Mix, I’ve been making it myself for quite a few years now. It’s not only quick and easy, but it makes an enormous amount, making it a perfect recipe for a holiday party or for giving away to neighbors and friends. Before I share this recipe, let me clarify – today, the 15 Minute Supper bloggers are sharing New Year’s entertaining-friendly non-dinner recipes for the holiday. I promise I’m not advocating making this recipe for dinner. I am also not advocating eating all of this yourself, though I wouldn’t be surprised if you were tempted. It really is so good (as long as you don’t concentrate on the list of ingredients). Just trust me on this one – pretend you don’t see those first 3 ingredients and just make this. Stir butter, corn syrup and sugar in a pan and bring to a boil for 3-4 minutes. Mix remaining ingredients except white chocolate chips in a very large bowl (or separate into two bowls). Add white chocolate chips and mix some more. Pour syrup mixture over the dry mixture and toss. Spread mix out on waxed paper. It's totally acceptable (and expected) to eat it while hot, but be sure to let it cool before storing or giving it away. The original recipe calls for 1 cup each of chopped almonds and cashew halves, but I usually just throw in whatever nuts I have available - walnuts, pecans, almonds or cashews - or a combination of a few of them. Don't eat nuts? It's fine to leave them out, too. It's also fine to throw the white chocolate chips in with the rest of the ingredients, but they WILL melt if you pour the syrup mixture directly on top. I prefer to have my chocolate chips stay intact, but I've eaten this Chex Mix with melted white chocolate throughout, and that's pretty amazing, too. It's all about preference! This week we are sharing 15 Minute recipes to get you through your New Year’s Eve parties. I think you will love these awesome recipes that are party worthy, but that will keep you hangin’ with your guests instead of being a slave in the kitchen! Happy New Year! 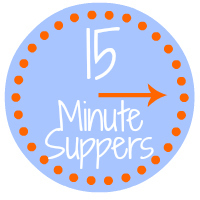 If you are a blogger and you’d like more info, please check out the 15 Minute Suppers website or ask to join the Facebook group to participate on Fridays…we’d love to have you join us. © 2013 – 2015, Food Fun Family. All rights reserved. Is this suppose to stay sticky or will it dry out? It tastes great but still very sticky. It’s rather sticky (hence the name) but it definitely does dry out a lot as it sits and cools. 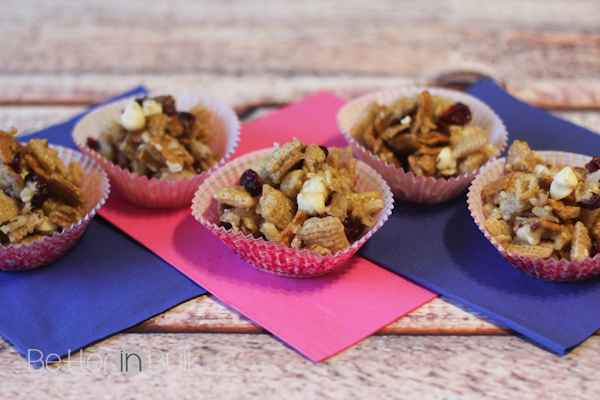 If it’s still too sticky for your taste, you can toss in a little extra cereal. What a yummy treat! I love the idea of putting it in baking cups! I love to have snacks like this on hand for parties and road trips. Thanks for the new ideas! 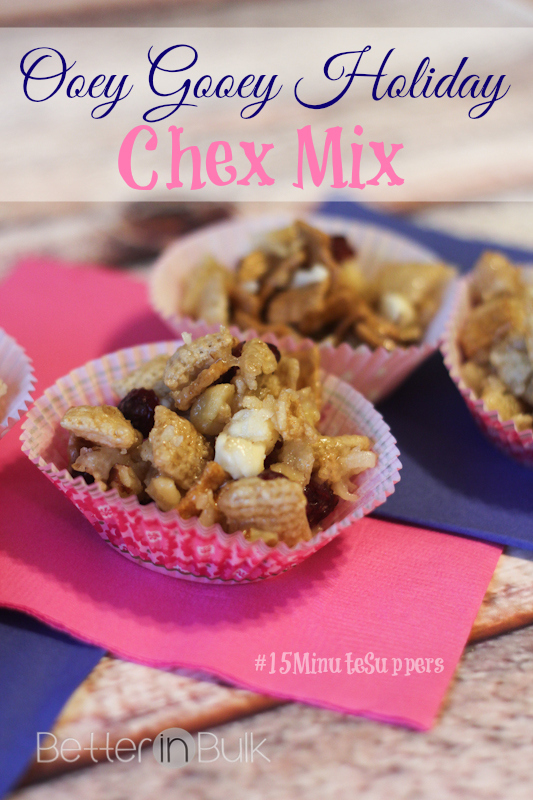 Oh yum, I love homemade Chex Mix (especially sweet)! This looks super delicious. I love chex mix but this sweet version sounds even better. Definitely sounds like a treat my kids would enjoy!